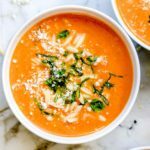 Blended roasted roma tomatoes make this soup thick and creamy with a sweetness thanks to carrots that's topped with fresh basil and orzo pasta. Preheat the oven to 400°F. Line a rimmed baking sheet with aluminum foil. Stem the tomatoes, then slice them in half lengthwise. Remove the seeds by gently squeezing them out (if you feel like it), or remove with a spoon. Lay the tomatoes, cut side up if cut in half, in a single layer on a baking sheet lined with foil. Roast for 40-50 minutes or until the skin softens and begins to burst. Discard the herbs and 4 cloves of the garlic, and set aside. In a large stock pot over medium heat, melt the butter. Add the shredded carrot and onion to the pot and sprinkle with 1/4 teaspoon kosher salt. Sauté for five minutes, stirring often, until the vegetables are soft. Add the tomato paste and continue to stir for one minute. Add the tomatoes and 4 cloves of the garlic, the broth, and cook for five minutes. Add the tomato mixture to a blender. Vent the top of then blender and blend for 30 seconds or until smooth, or use an immersion blender until smooth. Add back to the pan and stir in the half-and-half. Cook over medium heat for 5 minutes or until warmed through. season with more kosher salt to taste and divide among serving bowls. Serve hot with 1/4 cup orzo per bowl, and sprinkle with Parmesan cheese and fresh basil.